It's sad that someone is ripped off like that. I guess if the buyer should do a bit of research first. 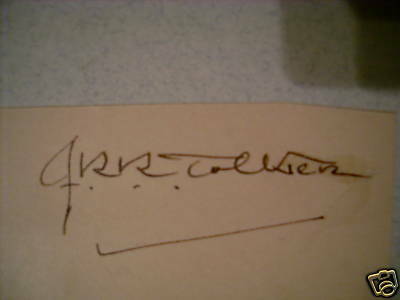 £150 for Tolkiens signature -bargain! Been in contact with the seller. The buyer has been fully refunded, the book will not be resold again... it seems the seller had no bad intentions and was not aware that the autograph was not genuine. Even worse, an auction house sold it to him and claimed it to be genuine. Now the seller had a simple request for all of us... he was wondering why we over here can discuss the signature, but no-one ever contacted him about it. So maybe we should try to be a bit more active. I myself had gone tired contacting the sellers of fake authographs, because either they were not replying or used very offensive language. In some cases however, the seller is unaware of what he is doing. I have to echo Beren's experiences here - been in contact with a lot of sellers (and buyers back in the day when you could see who they were) and never saw anything good come of it, so I don't do it all the time any more. I'll see if I can work something out with eBay (know a lot of people there, their offices are about two miles from me) for a better reporting process, but not likely to get a lot of institutional support. I agree that as a group we should perhaps make more of an effort to communicate our suspicions regarding various eBay auctions. But, you basically hit the nail on the head with your own comments Beren. Sellers don't reply; and there are plenty of suspect auctions out there. We don't all have the time I guess. Beren wrote: Now the seller had a simple request for all of us... he was wondering why we over here can discuss the signature, but no-one ever contacted him about it. I've had the same response from sellers; usually no reply; sometimes 'oh, thanks' but no real change. Posting forged signature image for posterity (before eBay expires the auction).